On Dec. 15, the Vienna-born master of funk will leave the [Cannonball] Adderley group to become co-leader with saxophonist-composer Wayne Shorter and bassist Miroslav Vitous, of an as yet nameless quintet. The drummer will be 21-year-old Alfons [sic] Mouzon, who has worked with Roy Ayers and recorded with Gil Evans, and the trumpeter will be New Orleanian David Lee, who has played with Willie Tee and the Souls. So I think Down Beat was talking about drummer David Lee, Jr. That David Lee did indeed hail from New Orleans and had been a member of Willie Tee and The Souls. And he was certainly of a caliber to play with Zawinul, having just recorded on Joe’s eponymous album alongside fellow drummers Billy Hart and Joe Chambers. It seems entirely plausible that Joe could have considered him for a new band, perhaps even as a second drummer or percussionist. In addition to Lee, two other New Orleanians performed on Zawinul: Multi-instrumentalist George Davis, who played flute; and saxophonist Earl Turbinton, brother of pianist, singer and songwriter Wilson Turbinton, a.k.a. Willie Tee. Joe got to know them during his years with Cannonball Adderley, when Cannonball befriended the Turbintons. They all had an affinity for each other, and at least in the case of Willie Tee and Zawinul, a friendship formed that would last a lifetime. It stands to reason that the “master of funk,” as Down Beat described Joe, might have gotten some of that funkiness by rubbing elbows with musicians from the funkiest place on earth. Cannonball Adderley, along with his cornetist brother, Nat, and bassist Sam Jones, came to New Orleans to record a jazz album, In the Bag, at Cosimo’s studio, using three fine young local players in the sextet on the date: Ellis Marsalis on piano, Nat Perrilliat on tenor sax, and James Black on drums. Those three were at that time also recording jazz and R&B sessions with Harold Battiste for AFO, the musician-owned label he headed. And, of course, Willie Tee did his first soul/pop sides for the label that very year, as well. Being a budding jazz pianist, Tee could easily have found a way to be at those sessions to observe and listen, as Battiste and Marsalis were his mentors. Joe Zawinul was already a member of Adderley’s band by this point, though he did not participate in those New Orleans sessions. But I am sure this is where Tee’s connection to Adderley and, thus, Zawinul began. At the time, Wilson Turbinton was just 18 years old. He had been under the tutelage of Battiste, who loved his smooth singing voice, since junior high school and acquired the monicker “Willie Tee” when he made his first recordings for AFO. Over the next few years, Tee recorded a number of tunes for the Nola label, some of which were picked up by Atlantic and climbed as high as number eleven in the national R&B chart. But he never had the bonafide hit to put him over the top, and after Nola’s demise, he regrouped and formed Willie Tee and The Souls with his brother Earl, David Lee on drums, George Davis on guitar, and George French on bass. George Davis, best known for his guitar work, also studied at Southern. As a songwriter he scored big with Aaron Neville’s breakthrough hit, “Tell it Like it Is,” which topped the R&B chart for four weeks in 1965, and hit number two on the pop chart. The Turbintons grew up in the same neighborhood as the Nevilles, and Willie Tee was the pianist for that session. David Lee obtained his first drum set at the age of 15 and started gigging immediately, learning music from his high school teachers and by jamming with his peers. After a stint with the Fourth Army Band, he returned to New Orleans where he rejoined the Turbintons and became a much in-demand rhythm-and-blues player. Earl, in particular, emerged as a leader in the Crescent City’s modern jazz community. Opportunities to perform this kind of music locally were limited, so in the late sixties he co-founded the Jazz Workshop, a short-lived non-profit venue where Down Beat magazine’s local correspondent, Charles Suhor, remembered Earl, Willie and Lee playing “start-of-the-art avant garde jazz.” The Workshop also hosted national figures on occasion, such as Rashaan Roland Kirk and Gerry Mulligan. Dickerson must have been a fascinating individual to Joe. He grew up immersed in the New Orleans jazz culture–he and Ellis Marsalis were high school friends and bandmates–and had just spent three years in Vienna, where a Fulbright scholarship allowed him to study classical music at the Academy of Music and Performing Arts. Of melding his jazz roots with classical music, he once said, “This is a result of being a New Orleanian. That’s all part of my heritage. I can’t imagine a composer, none of the great masters, not owing something to their folk traditions. As a matter of fact, those traditions really helped to make them who they are.” His statement brings to mind Joe’s later acknowledgements of his own folk music roots. One can easily imagine he and Dickerson getting along rather well. After his “Mercy, Mercy, Mercy” gave Cannon an enormous hit in 1966, the Adderley band was in New Orleans frequently, usually to perform, sometimes just to hang out with friends like Wilson Turbinton (Willie Tee) and his brother Earl and, always, to eat. During most visits, the band — or significant components of it – were guests on a radio program I did. Once, Joe came into the studio with Willie Tee. They played and laughed together at the Steinway, a pianist from uptown New Orleans and one from Vienna exchanging ideas and putting each other on in that fine southern way known as signifying. After the taping or after the Adderleys’ gig, we would all go in search of good things to eat, never a challenge in the French Quarter. Willie Tee and Joe Zawinul at WDSU, New Orleans, ca 1967. Photo courtesy Doug Ramsey. 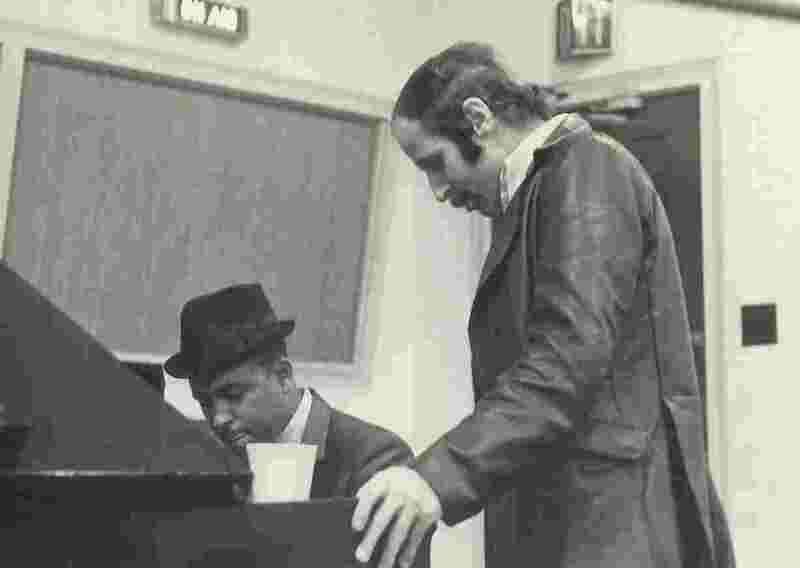 Phillips points out a direct connection between the two in Tee’s 1965 recording, “You Better Say Yes,” noting the close similarity of the guitar riff to the one Zawinul played on “Mercy, Mercy, Mercy,” recorded a year later. Although “Say Yes” was released first, Joe tended to have a stockpile of little melodies that he might keep in his back pocket for years before incorporating them into finished songs. Joe once told me that “Mercy, Mercy, Mercy” came about from his work with the singer Esther Marrow. “We were improvising around and I played this little background, and the background was nice. So I played it again, and all of a sudden it was a tune.” Maybe Tee heard him “improvising around” with it. Or maybe Joe heard that riff from Willie Tee first! Adderley was impressed enough with Tee to use his influence to get him a contract with Capital, Cannonball’s label. The only published result was the album I’m Only A Man, which included Joe’s tune “Walk Tall.” Recorded in Los Angeles under the direction of David Axelrod, who produced Adderley’s albums, I’m Only A Man was an over-produced effort that failed to present Tee in the best light. Capital released a few singles from it, which made little impact on the charts. Once again, Tee returned home and regrouped, forming the funk band The Gaturs in 1970. An example of the stew Tee was brewing is his song “Gatur Bait.” Decades later, Tee reaped a small windfall from royalties and usage fees when his songs were sampled by rap and hip-hop artists who mined them for grooves. Meanwhile, David Lee and George Davis joined Dizzy Gillespie’s band, both staying long enough to record a couple of albums. According to Lee, Gillespie happened upon one of his gigs on Bourbon Street in 1969–perhaps with The Souls, or with Earl’s or Ellis Marsalis’ jazz trios–and offered him a job. Dizzy probably heard Davis at the same time. Wolfgang’s Vault has a live recording of Gillespie’s band at the Fillmore East, April 18, 1970. The liner notes say, “The music has minimal comparisons to the traditional bop-jazz sound that cemented Gillespie’s reputation. Although not overtly funky, the music does reflect the musicians’ awareness of funk grooves.” Lee and Davis absolutely contributed to that feel. An interesting footnote for Zawinul fans is that the “boogaloo” beat was popular at the time, and Lee recalls that “Dizzy was bridging the gap between boogaloo, swing and be-bop.” “They call it hip-hop today, but it was called boogaloo in the sixties,” he remembered. Of course, Joe long took credit for “inventing” the hip-hop beat himself on Sweetnighter. I guess he had competition. Around 1970, Lee and Davis moved to New York, where they both recorded with Joe. Lee became a part of the city’s loft scene, blending jazz, soul and funk with Roy Ayers and Lonnie Liston Smith. Lee was a melodic, aggressive, improvising drummer who brought an element of New Orleans funk to his playing. He remained active in New York throughout the seventies, notable in Sonny Rollins’ band, and self-produced the extraordinarily rare album Evolution, of which only 400 pressings were made. Health problems ultimately forced him to return to New Orleans, where he continued to gig and teach. Davis also stayed in New York for many years and became a very successful session musician, with hundreds of credits to his name. So the most probable explanation is that Joe kicked around the idea of a band with Earl, and possibly David Lee, considering he chose them for his recent studio dates. Despite his later retelling of the Weather Report story, which made it sound as though he and Wayne were destined to join forces, Joe likely considered various options for his post-Cannonball future. For instance, in September 1970 he took up an invitation to join Miles Davis’ live band along with Vitous. That didn’t pan out because by the time Joe got there, Miroslav had come and gone, recognizing that Miles’ new direction was not for him. Joe also recalled that Wayne had wanted to form a band with Chick Corea and Roy Haynes, but “communications difficulties” scuttled it. And Michelle Mercer, in her book Footsteps, describes how Wayne went so far as to feel out the booking possibilities for a Wayne Shorter-led band. It wasn’t until the fall of 1970 that the band known as Weather Report solidified. While Joe secured his spot in the annals of jazz history with Weather Report, Willie Tee cemented his place in New Orleans music lore through his collaboration with the Wild Magnolias, a Mardi Gras Indians group. In 1970, Tee appeared on a double bill with the Magnolias, and his improvisation with the group led to the first commercial recordings by Mardi Gras Indians. Tee acted as the musical director, blending his brand of funk with the Indians’ chants. They subsequently toured Europe and the US, opening for acts such as Gladys Knight and Aretha Franklin, even playing Carnegie Hall. Earl, Willie and Lee remained fixtures in the New Orleans music scene for the rest of their careers. Tee recorded one more major label album, Anticipation, and later enjoyed success overseas as a result of the revival of soul and funk in the DJ/dance clubs. In 1988, Willie and Lee lent their talents to Earl’s only album under his own name, the well regarded Brothers For Life. Earl was an active performer, lecturer and educator until suffering a stroke in 2002. Joe and Willie remained life-long friends. Zawinul recorded Willie’s ballad, “Can It Be Done,” on Weather Report’s 1984 album, Domino Theory, with Carl Anderson handling the vocal. Tee’s own version can be heard on the 1991 compilation, Keys To The Crescent City, on which he performs four of his own tunes on unaccompanied piano. This rendition represents much of what Willie Tee was about. In August 2005, both Turbintons’ homes were destroyed in the devastation wrought by Hurricane Katrina. Willie recalled that when the flood waters subsided, “I went home for the first time expecting the worst and found worse than the worst.” It was a fate that befell a shockingly large number of New Orleans musicians. Weeks later, Willie joined Zawinul for a benefit concert called “Charity Event for the Lost Children of New Orleans” at Joe’s Vienna club, Birdland. Photographs from the event can be seen here. After Katrina, Willie accepted a position as artist in residence at Princeton University before moving to Baton Rouge, Louisiana, where his brother had also relocated. He was inducted into the Louisiana Music Hall Of Fame on April 14, 2007. In August, Earl died of complications from lung cancer. Around the same time, Willie was diagnosed with colon cancer, from which he succumbed just weeks later. In an amazing coincidence, both Joe Zawinul and Willie Tee died on the exact same day: September 11, 2007.